In a season full of surprises, disappointments, and overall shocking moments, the amount of injuries in the NFL seems to be taking a back seat in terms of press coverage. After 8 games, 45 players had suffered season ending ACL tears alone. In terms of shock value, these injuries have range from mild (Reggie Wayne) to disturbing (Dustin Keller). Furthermore, the players being lost to these injuries aren’t just backups and role players (not that that’s a consolation), but star players and crucial pieces for teams. Reggie Wayne, Sam Bradford, Maurkice Pouncey, Geno Atkins, and Jeremy Maclin are just a few of the players that have been lost to the knee injury this year. With all the focus on concussions recently, people are missing the fact that there is a new epidemic of injuries spreading now. In comparison to the 45 this year so far, there were 32 ACL tears all of last year in the NFL. Teams and doctors are having a difficult time isolating the exact cause of the recent outbreak. One hypothesis offered was that the plague of injuries is caused by limited practice time. The amount of conditioning required by an NFL to have his body sustain all the hits of a 16 game regular season is extremely strenuous and difficult. With training camps and practices being cut shorter and shorter for “safety purposes”, they may be inadvertently causing an even bigger problem. A second hypothesis offered also flips the NFLs new safety rules on its head. Some believe that these injuries are being caused because players are lowering there helmets in order to avoid fines. The NFL has a rule now that invokes a $15,000 fine for helmet-to-helmet hits. This hypothesis ignores the even further penalties and fines that are handed out for hitting the Quarterback. No matter what the cause may be, all signs point to the NFLs new rules as being a reason for the recent outbreak of ACL injuries. Ironically, the NFL invoked these rules to try to increase safety. This plan seems to be backfiring with terrible consequences. 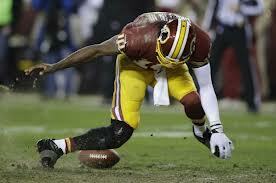 There are many other hypotheses out there for these nasty knee injuries. People can sometimes blame the playing surface (I’ve seen a friend blow out his knee playing soccer on a field with less than ideal traction), but there is really one main cause. Many of the worst knee injuries in the NFL, and unfortunately one of the least preventable causes, happens from low hits. Most defensive players are taught to wrap up the legs of players to take them down. That kind of hit sometimes can lead to players just diving at the legs, and causing brutal damage to the knees. Willis McGahee, Joe Theismann, and most recently Dustin Keller, all went down because of helmet contact to the knee. It just attributes the violence the game of football has, and the lack of control for player safety that the league is able to commission unto their players.